Register your mobile with way2sms. Click on the 'mail alerts' link near 'sign out' tab. Obtain a way2sms mail id. 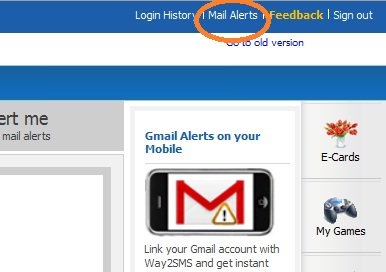 Now login to your gmail account for which you need SMS alerts. Go to Settings and Click 'Forwarding and POP/IMAP' tab. Enable forwarding and provide your way2sms mail id. Your verification code will be sent to your mobile as SMS and your way2sms inbox as mail. Now, you can receive SMS alerts for your gmail via way2sms. Note: You can also activate alerts for your y! mail in case your mail domain is 'yahoo.co.in' and also for other mails if forwarding option is available in that mail provider via way2sms. Hey. Nice Idea krish. :) Keep posting :) Superb article :) But, where are the mails forwarded? Will they remain in the Inbox of way2sms? @ Krishna : All forwarded mails will be discarded and only direct mails will be displayed in the inbox tab of way2sms da... However, Mail alerts will be delivered on your mobile for all your Mails.